Do you like to own kitchen gadgets which are associated with famous chefs and food network cooks/chefs, I do. Not that it'll make me cook like them but it's kind of a pampered feeling, when you U get something like that, specially when it's gonna stay outside on the kitchen shelf (little show off won't hurt anybody right). So, thanks to CSN stores who have 200+ online stores and over 1 million products I own my first piece of kitchen equipment which has name of one of our favourite chefs on it.....BAM!!! If you are thinking Emeril Legasse, you guessed it right. If U remember my this post I got an offer from CSN to review any product from their site. I took few days browsing for single burner grill pan(cast-iron) and finally asked DH for some help in deciding and it took only few minutes and order was done. The moment he saw reversible feature on this YES one side is Grill and other side is Griddle, he said BAM! this is what your kitchen need. I'm going to share the recipe for grilled chicken I made using my new Emerilware Cast Iron Reversible Grill/Griddle, review after the recipe. Those who don't have a grill pan can surely bake it in the oven for around 30-40 min. at 350 degree F, depending upon the size of chicken pieces oven time will vary. Note : I'm giving the recipe for 2 chicken breasts, which can easily fit in a pan also. If U are going to use two burner grill U can easily double the recipe as it can hold 4 chicken breasts I used combination of white(breast) meat and dark(leg pieces) meat because I wanted to see how much time does it take & which one gives the best result, check the review at the end of the recipe for details on that part. Prick chicken with fork at 5-6 places. Mix rest of the ingredients using small food processor/blender and marinade is ready. Marinate chicken breasts in the above mixture for at least 4-5 hours. I marinate meat a night before as it gives very flavorful & moist result. Keep it in the fridge. Take the chicken out of the fridge around half an hour before U want to grill it. Prepare the grill, as I'm using double burner grill so it sets onto back & front burner. Before turning the gas on using a brush or kitchen towel oil the grill, make sure you get the oil on all the grill lines as this is not a non-stick grill so we gonna need that oil. In case of any x'tra oil on the grill blot dry it using some paper towel. I kept back burner on med. high and front burner on high(b'coz front one is small). Once it's hot adjust the heat level to med.. I adjusted back one to med. & front one to med. high, idea is to maintain same level heat(in my case I wanted med. heat) on both the burners so grill can maintain the same temp. (read notes in the review as I had a problem here). Once the grill is hot put the chicken pieces onto it. I used my other cast iron pan to put some weight onto the chicken so I can get nice sear & grill marks(main reason for getting the grill) on the meat. After around 7-8 minutes flip the chicken and cook for another 7-8 minutes. Use same tech. to get the marks on the other side too. I cooked chicken breasts for around 18 minutes in total. Once the chicken is cooked, take it off the grill & cover it with foil & let it sit for 5 min. or so. Serve it with chutney of your choice and some salad. About Grill/Griddle : It's an Enameled Cast Iron by All Clad(a well reputed name in the kitchen world). Everyone can not understand how cooking can be fun when you have to move around a pan or a grill which is almost 13 & 1/2 pound in weight. Let me explain in simple words you get little extra iron in your diet when you cook in iron pots and pans, little extra flavor and a little workout at the same time and the satisfaction after looking at those grill marks priceless. 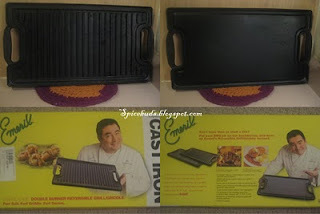 It's a reversible grill/griddle so that means one side is grill(with ribs) which can be used to make grilled meat, seafood, vegetables and grilled sandwiches like panini and you can have classic char grilled look specially on meats(with criss cross marks) and taste. Food cooks on elevated height for low-fat results. Another side is griddle(flat surface) which can be used to make eggs, french toast, burgers, pancakes etc. 1) Grilled Fish : I used my this recipe & cooked 3 fillets of fish......2 tilapia & 1 rainbow trout.Now these are delicate fishes so didn't wanted to press them for grill marks. they cooked in around 8-9 minutes but did got stuck little bit(I had oiled the grill) and very little grill marks, wasn't very happy decided to grill fish steak next time as that is little more solid meat. But after few days saw 2 famous chefs(diff. shows) on food network grilling same tilapia and there result was also very much same like mine(now feeling much better). 2) Grilled Chicken : Chicken breasts were very moist(were done in 18 minutes) & was so happy to get the criss cross marks (to get that, turn the food by 1/4 circle once it's half way on the first side). I did used meat thermometer to make sure it's cooked. The problem here was dark meat, chicken legs do take longer time to cook so I did gave them a go ahead but by the time all other pieces were cooked legs were still raw from inside & because the grill was half empty it was making a smoke plus I wasn't sure if keeping them longer will still keep the meat tender so I finished cooking them in my toaster oven for another 20 minutes or so. For next time I have decided to use only one kind of meat at a time. 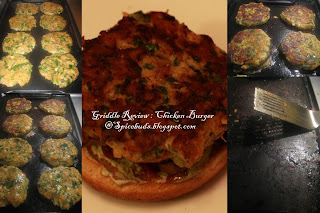 3) Burger on griddle : I really loved these. I used my recipe from here for meat balls & instead made burger patties 8 patties in 10-12 minutes, that's quick and in the mean time toasted the buns in toaster oven. 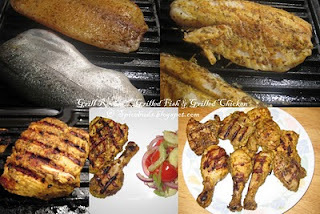 Cleaning Grill side : I loved the food but I really did not liked to clean the grill, though it's pre-seasoned & I also applied oil before grilling but still food got stuck & reaching all the spots in the grill can be time consuming(I'm talking 15 min. or so). U can not use any harsh metal brushes & also it's not advisable to soak cast-iron in water for long time. So for next time I'm gonna use a toothbrush I'm hoping that will make my job easier and also I might try cooking spray instead of oil if that works better. Cleaning Griddle Side : This one sure was easy, took may be couple of minutes. Weight & Storage: As I mentioned above it's around 13-14 pounds, not for a kitchen where U don't have a space to leave it on the kitchen top somewhere as it can be really heavy if U gonna store it inside after every use, chances are U might not use it at all. I don't have a very big kitchen so where I'm keeping it---- I have around one feet of counter space between pantry closet & stove, so I'm keeping it there on top of a non-skid mat, in standing position leaned to the pantry closet. Other Things to note : Though it is suppose to maintain heat level, I felt electric gas is not the best option for this as the food kept on the small burner side took longer time because the burner does not cover all the width of grill on its side so it wasn't very hot on the sides. Yesterday checked some reviews on the web & most of them said the same thing about using it on electric burner,but it's great for gas stoves. So, changing the apartment is one option I think I should consider now......ummm.....or may be just try to put only that much food on the smaller side burner which can fit on top of the burner area(I guess second option is more practical so I'll stick with that). Enameled cast iron construction for superior heat retention and distribution. Tough enamel surface reduces odor absorption. Suitable for all stove tops, excluding glass and ceramic cook tops. Cost, Shipping & handling : Cost of the Reversible Grill was $49.95, it seems like a pretty good deal. It did took around 3 weeks to get my grill some confusion as FedEx left my package at the apartment office without any notice on my door & I kept waiting. Finally got it at the end of November. My Final words for this Reversible Grill : I like it, food cooked on it was moist & flavorful. I still have to try many things on it(most important one is to get my husband addiction of this, so that I can have vacation from the kitchen sometime...BAM!). I'm comfortable using griddle on any day but for grill I'll def. prefer weekend as cleaning is little time consuming, but once I get hang of it then it might be different. Disclosure : Review given above about the Emerilware Reversible Grill is totally my opinion, it's no way influenced by any company or person. I was given an opportunity by CSN stores to do the review of any product from their site so I got this grill for free from their site. I have not received any money for the review, from CSN Stores or any other company or person. Extremely delicious looking grilled chicken. Very Comprehensive recipe. Grilled chicken looks delicious love it totally. Interesting review, grilled chickens tempts me a lot.. I am going to try this on my Cuisinart Griddler; looks so good.